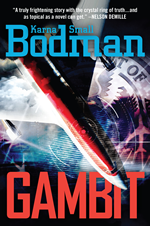 This new, edited story of Gambit is the second in The White House National Security Series. Dr. Cameron Talbot, famous expert on missile defense systems returns to investigate how American airplanes could plummet from the sky – though nothing shows up on radar and none of the usual Terrorist suspects have claimed responsibility. With the country in a panic and the economy taking a nose-dive, the beautiful scientist finds herself once again enmeshed in international plots as well as a romantic triangle in the highest levels of government.